The enchanting wedding of Mr. Chad Orman and Mrs. Caroline Hurst Orman last spring took on all of the alluring shapes, sounds and magnificence of a springtime garden. The setting was historic Heartwood Hall, an 1840s home replete with natural beauty. The bride and groom, who met in ninth grade English class, wanted an intimate, serene feel for their wedding day, and they wanted the decor to reflect that with rustic, sylvan charm. Designer Kevin Coble and his team from Le Fleur were paramount in fulfilling Caroline’s vision, and the result was a floral masterpiece. From ceremony to reception, Heartwood Hall was a storybook setting draped with white and green for a wildflower feel. Scents of fragrant gardenias, calla lilies, roses, freesia and rosemary added to the splendor. The floral theme was introduced by letterpress invitations styled with lily of the valley, a favorite bloom of the bride’s. Invitations and coordinating programs were created by The Stovall Collection. The floral theme was introduced by letterpress invitations styled with lily of the valley, one of the bride’s favorite blooms. Invitations and coordinating ceremony programs were created by The Stovall Collection. Audrey Hurst had a multifaceted role as wedding planner and matron of honor. “It was an exciting wedding to plan, as the bride was my husband’s younger sister. Family dinners became prime planning time! It was a welcome challenge to learn how to juggle matron-of-honor duties and make sure everything went according to plan,” Audrey says. 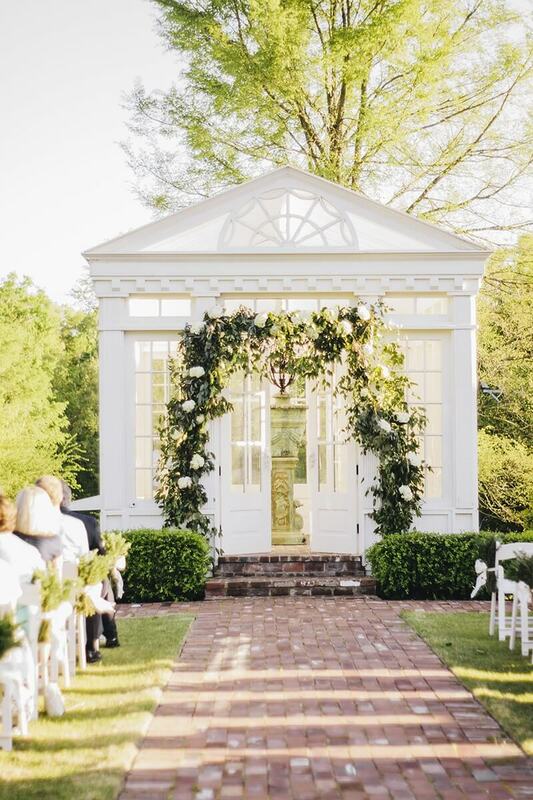 The ceremony took place on the Heartwood Hall grounds in the Four Seasons Garden, an area that features manicured boxwood hedges and plantings of roses, azaleas and crepe myrtles. The arrangement resembled an outdoor room. Guests entered through an arbor passageway of antique wooden doors and were then escorted down a reclaimed red brick aisle to be seated. Clusters of fresh rosemary placed on the ends of chairs along the aisle introduced garden aromas of the evening, and the Beth Luscombe Quartet played classical selections. The Beth Luscombe Quartet played classical selections for the garden ceremony. Fresh rosemary placed on the ends of chairs along the aisle introduced garden aromas of the evening. The bride carried a nosegay-style bouquet of white mini calla lilies, tweedia, ranunculus gardenias, freesia and an assortment of herbs, including rosemary and mint with accents of dusty miller foliage. The bridesmaids carried coordinating bouquets, while the men wore understated boutonnieres of pristine scabiosa pod, seeded eucalyptus berries and rosemary. The men wore understated boutonnieres of pristine scabiosa pod, seeded eucalyptus berries and rosemary. Mood moss “C” initials were placed on the entrance doors for the names of the bride and groom, Caroline and Chad. The focal point for their exchange of vows was a birch branch and Southern Smilax vine arbor, with blossoms of white hydrangea placed throughout. The bride’s wishes were captured as she envisioned a simple, yet natural, backdrop for the ceremony. Her dress was an airy, timeless choice from The Barefoot Bride. Great Lengths salon and Heather Boutique and Spa assisted the bride and bridesmaids with hair and makeup inspired by the simple elegance of this event. The bridal party walked down a red brick aisle for the garden processional. The focal point for their exchange of vows was a birch branch and Southern Smilax vine arbor with blossoms of white hydrangea placed throughout. There was a cocktail reception immediately following the ceremony in the cobblestone courtyard before everyone headed to the Heartwood Hall barn, a breathtaking, expansive venue that was formerly a working farm structure. A stunning grapevine arch with hanging candles led guests down a pathway to the party. A stunning grapevine arch with hanging candles led guests to the party. An elegant buffet was prepared by Heartwood Hall. The bride’s cake by the Mad Lily Cakery was decorated with a floral garland by Le Fleur. A fun aside: Chad decided to forgo a traditional groom’s cake and instead had his favorite after-dinner treat, chocolate chip cookies with a glass of milk, served in glasses with his initials. The bride’s cake by the Mad Lily Cakery was decorated with a floral garland by Le Fleur. Chad decided to forgo a traditional groom’s cake and instead requested his favorite after-dinner treat: chocolate chip cookies with a glass of milk. Kevin accented large raw beams and support columns with ample amounts of fresh, leafy Smilax. He then incorporated white twinkle lights to help illuminate the room and adorned the 12 twig-and-branch chandeliers with fresh seeded eucalyptus, Smilax vine and touches of magnolia foliage. Ample amounts of fresh, leafy Smilax, white twinkle lights, fresh seeded eucalyptus and magnolia foliage created a sylvan atmosphere in the Heartwood Hall barn for a splendid reception. Seated tables were layered with natural burlap linens with an eternity stripe overlay to soften the rusticity of the room. Simple groupings of hybrid delphinium, hydrangeas, lisianthus, tulips and blooming branches in large, clear glass cylinder vases were a final touch. The focal point of the room was a large sphere of white hydrangea that hung in the center of the barn over the dance floor, where guests danced into the evening to upbeat sounds of the Party Planet band. The focal of the reception room was a large sphere of white hydrangea that hung in the center of the barn over the dance floor. Thank you to Caroline and Chad for sharing the story of your garden wedding with StyleBlueprint. It was a splendid evening that added yet another memorable event to the narrative of Heartwood Hall.